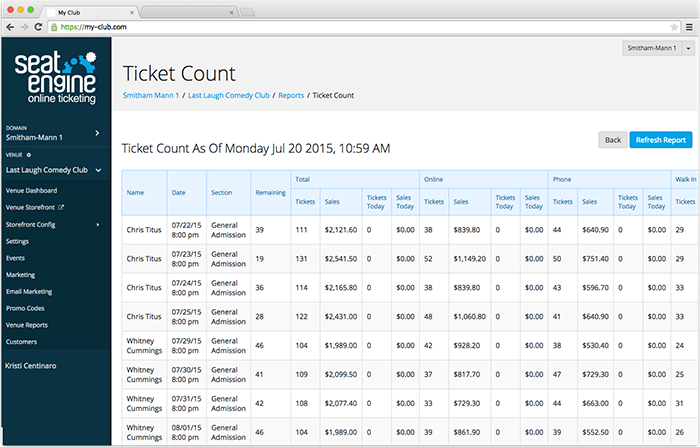 A simple, powerful ticketing solution for small to medium entertainment venues. We keep you by serving a great product. We get paid when you sell tickets. Period. Start selling tickets in less than 24 hours. Support by real humans 7 days a week. Your account comes with an easy to configure, mobile-friendly storefront, ready for you to customize with your brand logo and colors. 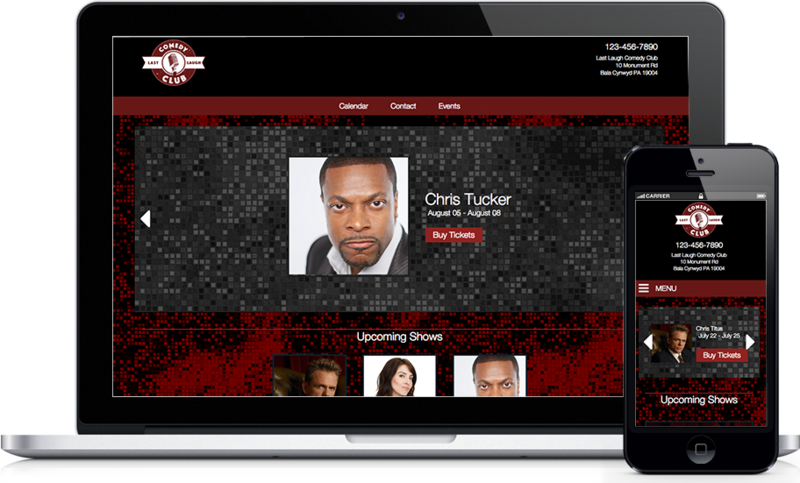 Customizable pages, nav, colors and more, complete with all you need to display upcoming events. Detailed reports for hundreds of data-points so you know exactly how your business is doing. The most vital info about your venue's revenue and ticket sales, at a glance. No need to pay for an outside service. 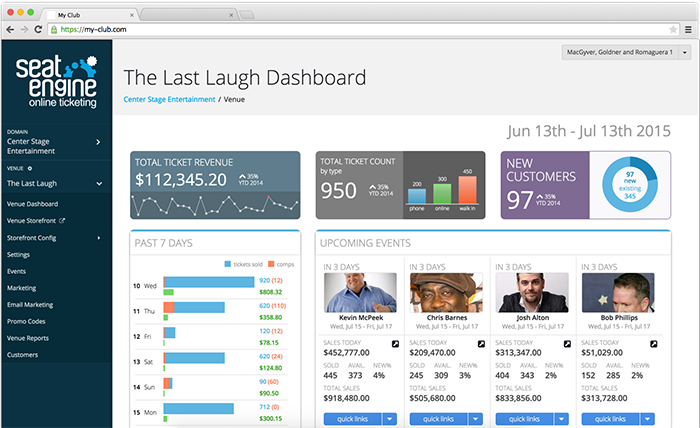 Seat Engine's built in Email Marketing Tool allows you to easily build customer email lists, manage contacts, send professional looking emails to your target audience, and track results. Get your money quickly after the close of your event with our weekly pay schedule via ACH funds transfer. Turn any iDevice into a ticket scanner by downloading our free app, Ticket Booth, from iTunes. By scanning the unique QR codes on each customer's Print-at-Home ticket, check-in becomes a breeze. Ticket Booth communicates with your Seat Engine account in real time to ensure that multiple check-in points all have access to the most updated information. Seat Engine makes it simple for you to be in complete control of your event. With our easy to use event management tools you can instantly see orders as they come in, adjust ticket pricing, change service fees, and modify ticket inventory. Build a complete database of your customers and get even more detailed analytics by adding in your Walk-Up or Telephone orders at no cost to you. Seat Engine will generate trackable links attached to your events which makes it easy for you to see up-to-date information about which marketing opportunities are the most profitable. Conveniently access Seat Engine from anywhere there is internet. No program downloads needed. No experience necessary. We have designed Seat Engine to be useable by anyone from Computer Novice to Tech Wiz. But in the case you should need a little extra training, we've got you covered. With our dedicated customer support team - Including your own Account Manager and Venue Support Representative - you can rely on us to be there should you ever have a question.